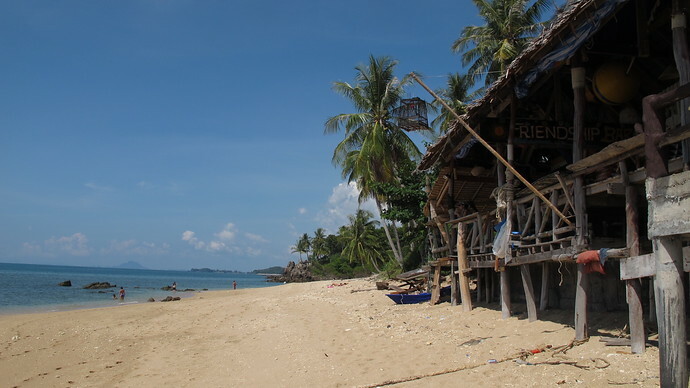 Klong Khong Beach is a 3 kilometre stretch of beautiful soft sand fringed with palm trees in the middle of Koh Lanta. It’s well-known for having very friendly locals. Klong Khong is a bit less developed and more peaceful than the neighbouring beaches. The accommodation here is nearly all family run giving a special personal touch and it’s slightly cheaper than the other beach areas. 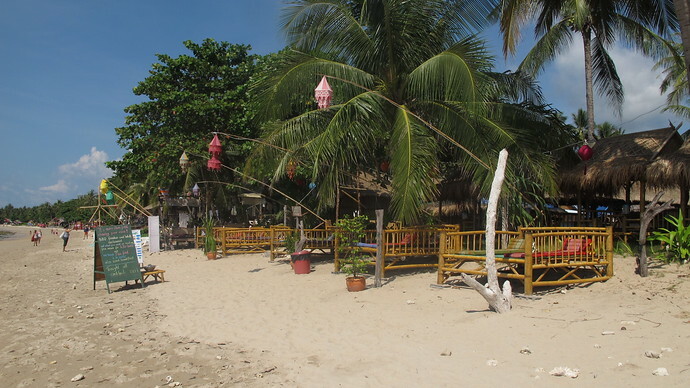 Klong Khong is a great place to watch the sunset and at night many bars have their own fire shows and parties. Check out The Sound Shack Bar, Fisherman’s Cottage, Where Else, The Chocolate Bar and Bubble Jungle who host parties on different nights. Some you may be able to dance until the sun comes up. Not so many restaurants are situated on the beach but are set back in the resorts. If you want really great food head south on the beach to Fisherman’s Cottage. For more recommendations about where to eat on Klong Khong, see our Best Restaurants And Places To Eat On Klong Khong page. During high tide Klong Khong’s beach and the colour of the water are amazing. However, whilst it is low tide many rocks appear in many places making it not good for swimming. Most resorts have swimming pools if you prefer to relax in the pool area. 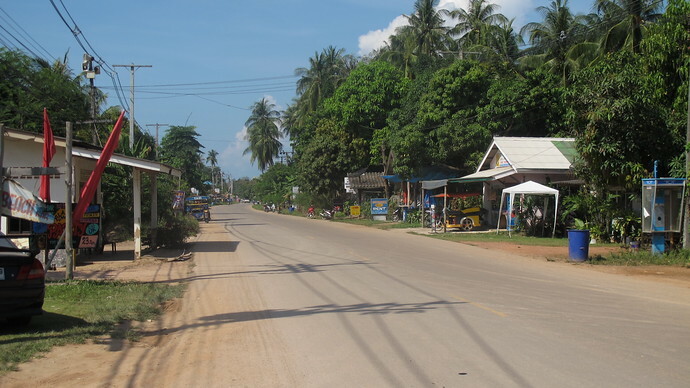 If you walk to the road you have a few scattered internet shops, coffee shops and Thai restaurants. Please take a torch with you as this stretch of road has no lighting. 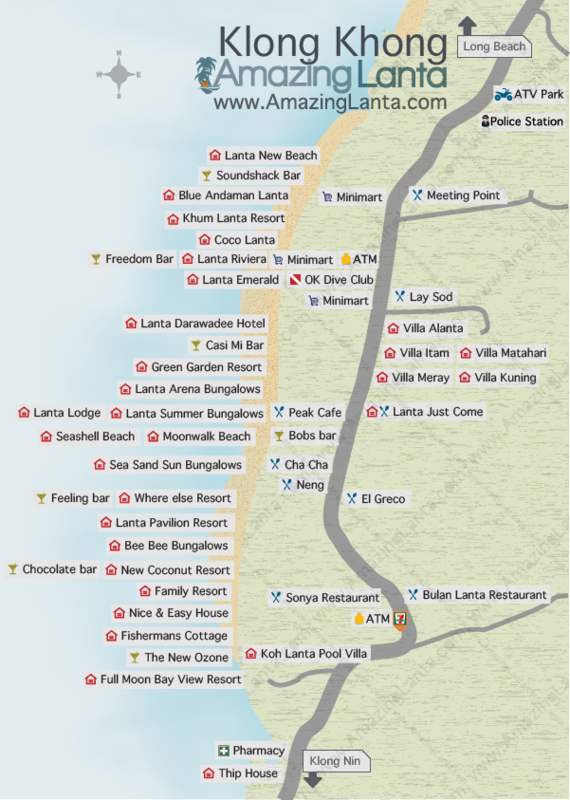 Easily see the location of all of Klong Khong’s hotels, restaurants and bars with our Klong Khong map. Rollover any of the labels on our Klong Khong map for a brief description, and click for more info. 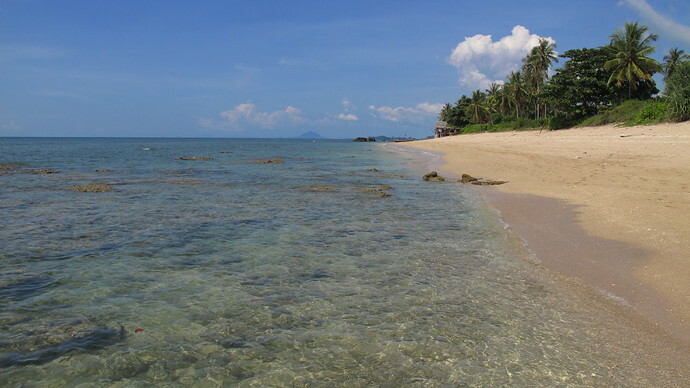 It’s easy to get to Klong Khong beach as we explain below. 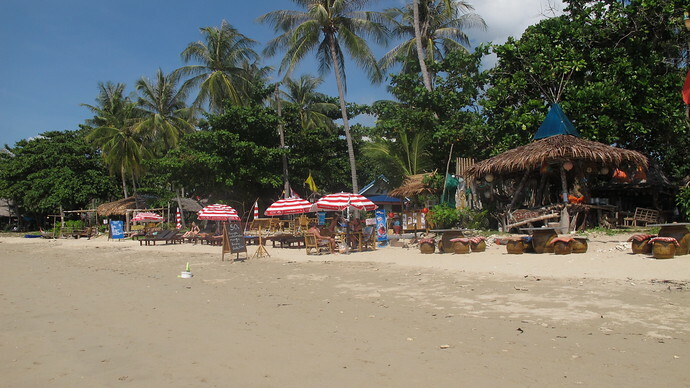 Klong Klong Beach is located in the centre of Koh Lanta. 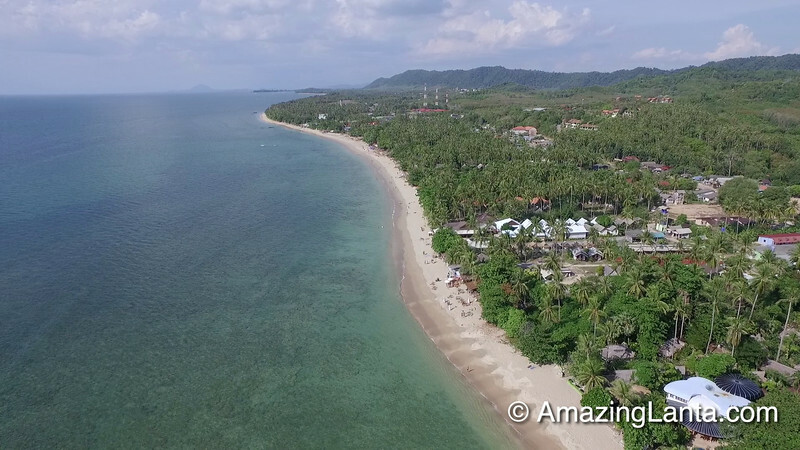 It’s the third-nearest beach to Saladan Village, which is where all visitors to Koh Lanta arrive, so Khlong Klong Beach hotels have a transfer time of about 20-30 minutes from Saladan to anywhere along Klong Khong Beach.